The story of Henry Box Brown is, of course, fascinating. I like that the end material of this book includes a letter from the historical record but dislike that the book alters one fact for a stylist reason. I found the illustrations beautiful but had an uneasy feeling from both the text and the illustrations that slavery was being portrayed as not quite so bad, except, of course, for Henry's wife and children being sold away from him. Sally Walkers depiction of "Henry's Box" explains his story of escaping slavery. Henry loved singing, which helped him and his family get through tough times. Henry and his family were slaves, and he was always scared that him and his family would be sold to other masters. Henry was sold to a tobacco farm master, where he met his wife Nancy, who he had many children with. Henry was devastated when his master sold his wife Nancy and children. Henry needed to find his family, so he began talking and searching for the Underground Railroad. Henry thought of a bright idea to find his family, and escape slavery. He stayed up very late, and built a box with holes, and chopped off his finger to get time off to escape. So since he could not work, his master told him to not come back, Henry packed water and went in the box, to hopefully end up in Pennsylvania, a freedom-land state. He travels, and goes through many hard ventures, Henry arrives in the freedom-land safely-singing his heart out! The illustrations are done very well by Sean Qualls, which emphasizes the meaning of the story. This would be great to use when teaching civil rights. And can be used for grades 3-6, due to the lengthy text, and the understanding of the civil rights movement. In the back of the book there is an author's note, which explains the true story of Henry "Box" Brown. The author explains that while writing this story, he made a change from the real story, in which Henry actually burns his hand with acid not cutting it with a saw. Reflection: This book made me think of other books about the underground railroad. Since I was little, social studies was always my favorite subject and I loved reading books about our history, especially stories about the underground railroad.Rational: This book is culturally specific because it tells the story of the lives of slaves and portrays the fears they had during that time in our history. Questions: Remembering: Who was the main character in the story?Understanding: What was the main idea of the story?Applying: What might have happened if those people would have opened up the box Henry was in before he made it to freedom-land?Analyzing: What motive does Henry have to finally sing his freedom song? Evaluation: Would you have helped Henry escape to freedom? Why or why not? Creating: If you were a slave living in that time, how might you have tried to escape? Freedom Song: The Story of Henry "Box" Brown (Hardcover) by Sally M. Walker A very interesting story about personal motivation and slavery. Henry has been a slave all his life. He did not want to loose his family. When they were sold out on him when he was working in the tobacco plant he escaped to freedom. A great introduction to the painful topic of slavery and the underground railroad. Henry was born a slave and was born with a song in his heart. It starts off with Henry being loved and all his different songs for work, sleep and play - just not the freedom song, as that would get you sent away - sold to another master. When Henry grows up, he works in a tobacco factory and still he sings. He gets permission to marry Nancy and they have children together. One day he comes home to see his wife and children leaving as they have been sold to another master. He decides to run away to Freedom-land. He makes a box, with 3 holes in it and mails himself to Freedom-land. What a journey and it's sad to think it was based on a true story. The illustrations in this book are my favorite thing about it. Making use of collage techniques and complementary color theory, Sean Qualls is able to communicate mood and rhythm affectively. Based on a true story, this book uses the tool of song to bring the reader from place to place. Beginning with his gather up song of "twist, snap, pick-a-pea words," to a cradle song crooned to his children, all the way to the shifting words of his freedom song, there is a beat to the words. In addition color is used to communicate mood, from the brighter colors of his childhood, to the dark muted colors of (view spoiler)[being forcibly separated from his family (hide spoiler)] to the return of brighter colors in the end when he finally escapes.This book in conjunction with others such as The People Could Fly, would be useful in a study of the underground railroad and the ways people escaped slavery, both literally and through oral storytelling. I love this story! One of the many stories written about Henry "Box" Brown, this song tells the story of his road to freedom, as well as gives a glimpse into how slaves would use songs to reach freedom. A beautifully written and illustrated story that depicts one of the (many) awful aspects of slavery: the separation of families. Based on a true story, Walker depicts the escape of Henry Brown in a box. Sadly, there's no historical record if Henry is reunited with his family (but I hope so). An excellent book that can facilitate a discussion of slavery for elementary aged kids. Henry Brown was born to slave parents on a plantation in Virginia. He worked in the cotton fields as a child and he was allowed to grow-up with his parents.Music was an important part of Henry's childhood and he always had a song in his heart and on his lips. He was afraid to voice his "freedom song", but it was always in his heart and mind.When Henry was almost grown, he was sent to work in a tobacco factory in Richmond. He met a young slave woman named Nancy and they were allowed to get married. Henry and Nancy had children and they lived together in a slave cabin. Henry was very happy and continued to sing songs to his wife and children.One day Henry learned that his family had been sold and would be sent far away. He was desperate to save them but he couldn't keep the family together. Henry was determined to escape to the North where he would be free.With the help of several men who "knew the way of the Underground Railroad", Henry planned his escape. He built a wooden box that was just large enough to hold him. He got in the box and his friend shipped him to Pennsylvania.His journey was very difficult and he almost died along the way. When he arrived at his destination, he was released from the box and lived as a free man for the rest of his life. No one knows whether he was ever reunited with Nancy or their children.Henry "Box" Brown was a real person who escaped slavery very much like it was described in this story. The story is documented by a letter that was written in 1849 by the man who received the box and set Henry free. This letter is now housed in a special collection at the New York Historical Society.This is an excellent resource to supplement social studies and history curriculum in the elementary grades. The subject of slavery is not always easy to explain to children, but this book provides an excellent way to show children how slaves lived, worked and were treated by their owners.The illustrations are excellent and add a great deal of value to the story. I highly recommend this book as an honest look at the American culture and history during the 1800s. Teachers and students are sure to enjoy comparing this title to the earlier version of the story, Henry's Freedom Box. The story describes the childhood of Henry Brown, born a slave on a Southern plantation where he picked cotton but kept his spirit up through song. When he falls in love with a woman named Nancy and is unable to do anything to prevent her and their children from being sold to another master, he decides to figure a way to escape by shipping himself north. While this picture book tells the same story told in Henry's Freedom Box, it provides additional details and focuses on the strength Henry draws from his own freedom song. Back matter includes a copy of the letter certifying Henry's journey in a box. An Author's Note provides additional information about the book's protagonist and the author's inspiration. I was disappointed that she chose to change a detail in his story--having him chop his finger rather than burn it with acid. The illustrations, dominated by soft blues and browns, draw to the eye into the text, almost softening the horrors of slavery. Henry and his family are shown relaxing together on a porch while he strums a banjo, for instance. Once again, as I read about this man's incredible courage and creative problem solving, I shook my head in amazement. The book may not be as strong as its predecessor, but it's still a worthy addition to a library. Text Connection:Text to Text:When I was reading this book, especially the part where Henry recounts how he feels like his box is shrinking, I kept thinking of Anne Frank. Both characters had to hide in small, cramped, uncomfortable places. As a reader, it is hard for me to imagine having to do something like that, but reading about these various accounts of characters who suffered these hardships helps me to understand it. Both Henry and Anne managed to overcome these physical discomforts in the hopes of freedom.Rationale:This book is clearly culturally specific as it deals with African Americans and their time as slaves. It is incredibly accurate regarding the culture as it is told about a true event. The author included additional historical information in the author's note, as well as a copy of the letter originally sent detailing this amazing story of escape. Bloom's Taxonomy:Remembering: What did Henry escape in?Understanding: What was the main thing that made Henry finally decide to try to escape?Applying: Based on the story, did all slaves want to escape? Why or why not?Analyzing: What evidence can you find that shows Henry loves his family?Evaluating: Why did Henry not want to escape right away? Creating: Design a model that shows Henry's escape, including a map. In the author's note at the end of this lovely middle grade picture book Sally Walker tell of how she first learned the real life story of Henry "Box" Brown's 1849 escape from slavery. She was a choir member and music lover, and was fascinated to later learn that Henry was a member of his church choir. She decided to tell his story with an emphasis on the power of music. Walker begins her tale with the joy and delight of a family welcoming a new baby.The story builds as Henry grows tall on Mama's cooking and smart on Papa's stories. The emphasis on family love, community strength, and the power of song to endure the blistering work and cruelty of slavery is what makes this book unforgettable. Henry sings work songs and play songs, and at night he sings sleep songs. His life is held together by songs of hope.This is a hard truth to read to young ones. But the fact that Henry survived and found a way to escape this grave injustice is a truth that children need to hear. This is more than a story of the horrors of slavery. A life that would make a man desperate enough to risk his life mailing himself in a box. It is also a story of the triumph of the human spirit expressed as music. I came across this at the library one morning when I was vollunteering and gave it a quick read. I was familiar with Henry Brown's story, and I liked this version of it here, which was written around the concept of songs that were inside Henry (working songs, family songs, and freedom songs). I thought that Harry's singing and longing worked well for carrying the story along through his life and adventures. When he finally devises a way to be free, this children's book did not shy away from how dangerous and difficult it was. And the thrill of freedom is easily felt and understood. The illustrations by Sean Qualls were fantastic, done with a very specific style that was both bold and appealing. Strong emotions came through loud and clear. Freedom Song: The Story of Henry "Box" Brown is the story of a young boy born to parents who were slaves. Henry Brown worked alongside his parents in the cotton fields. He had a love for music and was said to always be singing. The music seemed to help him get through the difficulties of being a child with slave parents. As Henry grew older he moved and began work in a tobacco factory where he met another slave named Nancy. Music remained an important aspect of Henry's life after he got married and had children. Henry Brown decided to escape slavery after his family was sold to a plantation owner far away. The story talks about the difficulties of Henry's escape, but through the help of friends he finally made it North where he began to live freely. This book would be excellent when integrating social studies with literacy. The vocabulary in this book is quite extensive, and depending on the age level of the reader, they may not know some of the terms related to slavery. When reading this story, one can teach context clues in order for the class to determine vocabulary words unknown. The illustrations in the book are great and the historical background behind freedom. Henry Brown was willing to put his life at risk for freedom and did so with building to box used to ship him to freedom. Singing was Henry's way of dealing with slavery and his inspiration to be free. Once Nancy and his children were sold he became more determined to be free.I think the author should have left the story alone by telling exactly what happened to get Henry away from the Masters plantation. This is a true story, the author should have stayed with the truth that he burnt his hand with acid. He did not chop his finger off. I understand that this injury better fit with the book but history is history and should not be altered to fit the needs ot the author better.Overall a great book for older children. I think it would be difficult to explain to true experiences of slavery to a young children and the sacrifices that Henry Brown went through for freedom. Freedom Song: The Story of Henry "Box" Brown is a true story about a slave who grew up singing songs and eventually made his escape after his wife and children were sold to another owner. Brown escaped by hiding in a box that was delivered to the free state of Pennsylvanian at the time. The only change that Sally M. Walker made to Brown's story is that to get off of working in the cotton fields one day Brown actually threw acid on his hands, but in the book Walker has him cut one of his fingers off. 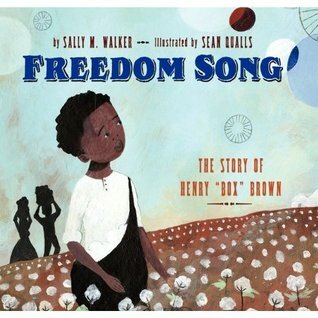 The illustrations are good and Sally M. Walker does a great job of addressing some of the hardships slaves had to face without getting to complex or mature for a young reader. A wonderful introduction to slavery in America for any child, and something that should be addressed at a young age. The parent(s) should most definitely have a plan on how to debrief the book, and how to answer difficult questions that a child might ask after reading this story. I have to admit when I picked this up at the library I kind of asked myself, "Why?" Don't get me wrong. It's always great to have multiple biographies about interesting historical figures, like Henry "Box" Brown. But Ellen Levine and the divine Kadir Nelson published a highly-lauded and very great picture book biography about this subject not too long ago. Does the new book measure up to its predecessor? Not at all, I'm afraid. Walker's poetic writing seems out of place. The slave cabin where Henry grew up looks comfortable, and the horrors of slavery (like Henry's wife and son being sold)are in soft pastels by Qualls. It's still an interesting book about an almost unbelievable subject--an escaped slave who mailed himself to freedom in a cramped box. But be sure to check out Levine/Nelson's Henry's Freedom Box. Freedom Song is a children's picture book about Henry Brown, who is escaping from slavery in a shipping box in order to find his family who were sold to another slave owner. The book starts from the day he was born and addresses slavery in the most simplified way possible for children to be able to understand. It is a powerful book that covers a difficult topic but does so in an engaging and thoughtful way. It is important for children's books to be purposeful so that readers can learn something from it, and Freedom Song achieves this. My only issue with the text is that it ends very abruptly and without answering the question of whether Henry will find his family, which isn't going to be satisfying for young readers. I would recommend this to a classroom of third to fifth graders so that they can learn about slavery. The story of Henry "Box" Brown's daring escape from slavery via a large wooden box. This story covers Brown's childhood through his marriage and the birth of his children. It uses music to link all of the pieces of Henry's story together.The inclusion of Henry's loving childhood family serves as good background knowledge that helps readers understand his actions. I appreciated the level of detail with which his journey was described. There were moments when Henry was in grave danger, such as when his box was turned upside down. These details helped support just how amazing Henry's completed journey was. Painting bring Henry's stories to life. I liked the way color was used in the paintings. When Henry's world is literally dark (inside the box) the colors of the paintings are muted and shadowed. When Henry completes his journey the colors are part of the celebration. Henry’s freedom box is a great children’s book that gives them a better understanding of the era of slavery. This book is about a boy named Henry who grew up in slavery. He was separated from his parents when he was a child and was sent to work with a new master. While Henry was in slavery, he met a woman whom he started a family with. He eventually ended up being separated from them as well. Henry was determined to gain freedom, so he was mailed in a wooden box all the way to Pennsylvania. I really enjoyed reading this book. Although it is a sad topic, it gives children great insight to what the daily lives of slaves were without being too confusing. Since children may not have that great of a concept of this yet, this book does a great job introducing it. I would recommend this book for fourth or fifth grade students. This is, of course, an amazing story of Henry Brown's remarkable and desperate escape from Virginia to Philadelphia in a box. Walker writes her version a song-like, repetitive narrative in the tone of a old spiritual. I was disappointed to see in her backmatter that she changed one of the facts of the story to better fit with her style. When writing one of the few well-documented stories of an escape from slavery, the details should be correct rather than altered for aesthetic purposes. Also, while I like Sean Qualls illustrations, it's hard to compare with Kadir Nelson who, in my mind, is one of the very best illustrators ever. Illustrator: Sean Qualls Publisher: HarpercollinsDate: 2012 Genre: BiographyStrength: This story tells the true story of Henry Brown as he found a way to freedom by having himself shipped in a box It speaks of determination to find a way out of hard circumstances. It speaks of the sadness and fear that slaves faced when family was ripped away from them. Interest: I love stories that use vivid imagery and words to tell the stories of our history and people in the past that have shaped history or made in impact in history in some way. Henry Brown encouraged others to be brave enough to find a way out of slavery. I have to admit that I was skeptical about this newest account of Henry "Box" Brown's daring and unconventional escape to freedom via the Underground Railroad as I'm a huge fan of Ellen Levine's version--Henry's Freedom Box, illustrated by Kadir Nelson. However, author Sally Walker takes a more lyrical approach to the subject by incorporating songs and spirituals into the story. The illustrations bear the mark of Sean Qualll's signature style. Students are drawn to Henry's story and this book would be a good addition to libraries and classrooms as an example of the workings of the Underground Railroad. Based on a true event, Freedom Song, is the story of a slave who rides his way to freedom in a shipping crate. Henry “Box” Brown was a boy with a song in his heart, and as he grew to be a man, that song was, increasingly, a song of freedom. Through a journey that almost ended in his death, Brown found his way to The North in a small box and went on to speak about abolition.Filled with fine artistry, this book illuminates—for a new generation—the inhumanities of the slave trade and the cost of freedom. Simultaneously, this narrative is a homage to close familial relationships and real courage and determination. A little-known story retold in a truly beautiful way. This was a well written picture book, full of great literary elements. The book does a great job of depicting that time period without getting into too many details for this age group. It is a moving story about the struggles many people endured. Henry's triumphant endurance gives hope to the reader, while at the same time lets a younger reader see the hardships during this time.The ilustrations are outstnading. They are interesting and colorful; they do a great job going along with the plot. I was very surprised that he actually mails himself in a box. I think the students would enjoy reading that twist. Like the more recent _Henry's Freedom Box_, this picture tells the incredible story of Henry "Box" Brown, an enslaved man who hid himself in a package sent to an abolitionist in the north. Incredibly, after a long journey, he made it to his destination alive and gained his freedom. The illustrations and sentiments are sweet, but I love the drawings in _Henry's Freedom Box_, so it's difficult not to hold Qualls' drawings to this high standard. As a scholar, I appreciate the inclusion of a letter sent in 1849 from James McKim, one of the recipients of the package in which Henry hid. Picture book version of the story of Henry "Box" Brown. 2 starred reviews -- BCCB & SLJ. Appropriate for elementary-age students or for read aloud. Illustrations are the strongest element -- love the textured art and the use of color. "...Dominated by subdued blues and browns, Qualls’s (Giant Steps to Change the World) artwork exudes his familiar folk art–like quality, with floating circles of various colors and patterns serving as a visual metaphor for the hope Henry’s song represents..."-- from PW Review. Sally M. Walker Sean Qualls - Sally M. Walker has written science books for children, including Earthquakes, an NSTA/CBC Best Science Trade Book of 1997. She lives in DeKalb, IL.